Angry crowds in Greece tried to break into the parliament building in an unsuccesful attempt to force MPs to vote “yes” in a no confidence vote. They called Prime Minister Alexis Tsipras a traiter as they fear the Government will surrender in a dispute with the Former Yugoslav Republic of Macedonia about its name. The government survived the vote but people aren’t happy. "I am here because I want to defend the name and the history of Macedonia," said one demonstrator. "We should not even discuss it. I don’t see why. There is only one Macedonia and it’s Greek. Everybody should accept that." Another outlined her concerns: "We want peaceful relations with our neighbours. But this country belongs to South Yugoslavia. "They should join NATO and the EU, but without using the name Macedonia. Macedonia is their land of our ancestors." The protesters say Macedonia ends up winning everything and Greece gets nothing in the deal. 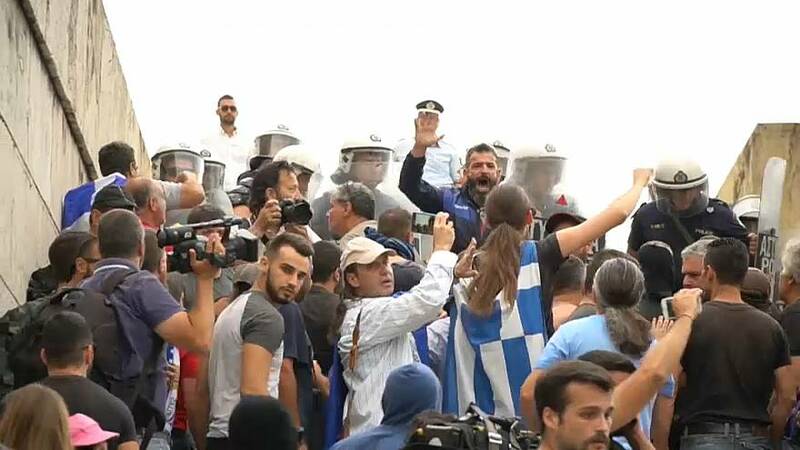 Euronews reporter Apostolos Staikos said: "The protesters who gathered outside parliament say "no" to the the agreement with the Former Yugoslav Republic of Macedonia. They’re also asking the government not to sign the agreement and to change its policy."